These are the words author/researcher Ann Malaspina uses to describe the legal practice of denying women the right to vote in 1872. Even though women could own property, pay taxes, hold a job, and raise children they could not participate in elections. * Because of a new law, the 14th Amendment to the constitution, all persons born in the United States have the same right as citizens. She told the men at the registration table she is a person and citizen. Therefore, she should have the right to vote. * After arguments with inspectors, she finally registered to vote. 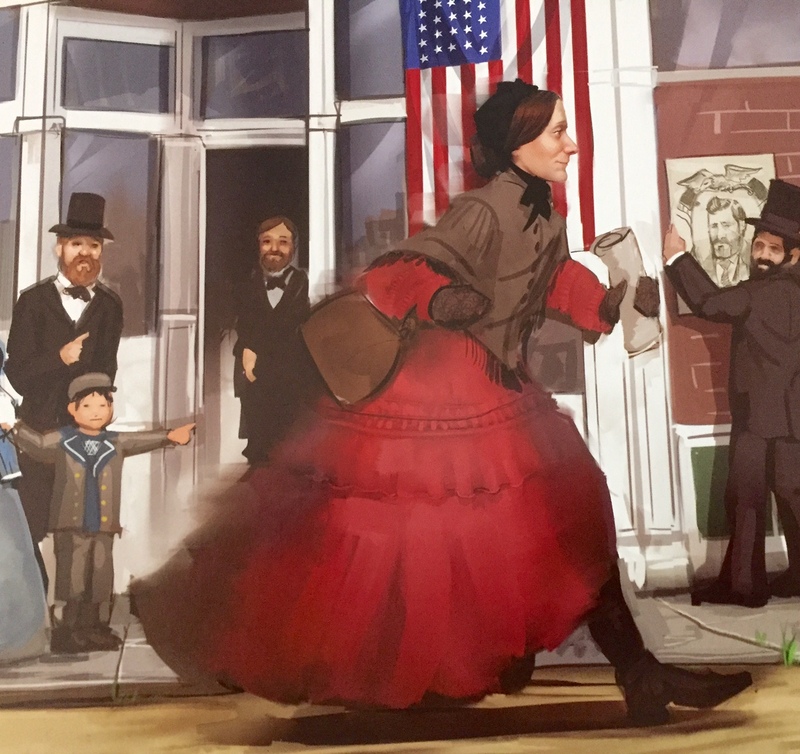 * On Election Day, November 5, 1872, Anthony raced to the polls and cast her vote at seven a.m. She had voted for a president! But trouble was brewing . . .
* On November 18, 1872, a deputy federal marshal stepped into her parlor intending to arrest her. She demanded that she be arrested properly, but he wouldn’t handcuff a lady. * In January 1873, Miss Anthony was ordered to pay one thousand dollars or go to jail until her trial. * She refused to pay. She didn’t want to give the court a dime. * As the trial grew closer, she argued her case all over the country: Washington, D. C., Philadelphia, Chicago. She visited Kansas, Oregon, and California. * At the trial, the judge pulled a paper from his pocket: “The fourteenth Amendment gives no right to a woman to vote,” he argued. * The judge banged his gavel and ordered Miss Anthony to pay one hundred dollars plus court costs. And Susan B. Anthony never did. At her 86th birthday celebration in 1906 in Washington, D. C. Anthony remained determined to secure women’s right to vote. “Failure is impossible,” she declared. Born February 1820 to a Quaker family where women were considered relatively “equal to men,” Susan B. Anthony left her stamp on history. Also, her image is imprinted on a dollar minted from 1979 – 1981. An energetic, self-disciplined teacher, she was refused permission to speak at a teachers’ convention and at a temperance convention, prompting her to focus on women’s rights. Early on, social injustice galvanized her to action. In 1890, she led the National Women’s Suffrage Movement. Determined and focused, she traveled far and wide to champion voting rights for women: Kansas, Louisiana, Georgia and as far west as Oregon and California. Called “The Napoleon of the woman’s rights movement,” she moved to Washington every winter to lobby Congress. Later, Ms. Anthony rallied for international efforts for women. Even Queen Victoria asked to meet her. She died in 1906, regrettably fourteen years before women were officially given the right to vote, 1920. I hope you will exercise your right to vote this November election. It’s a privilege we dare not take for granted. If you live in another country that extends voting rights, you can exercise this right as well. 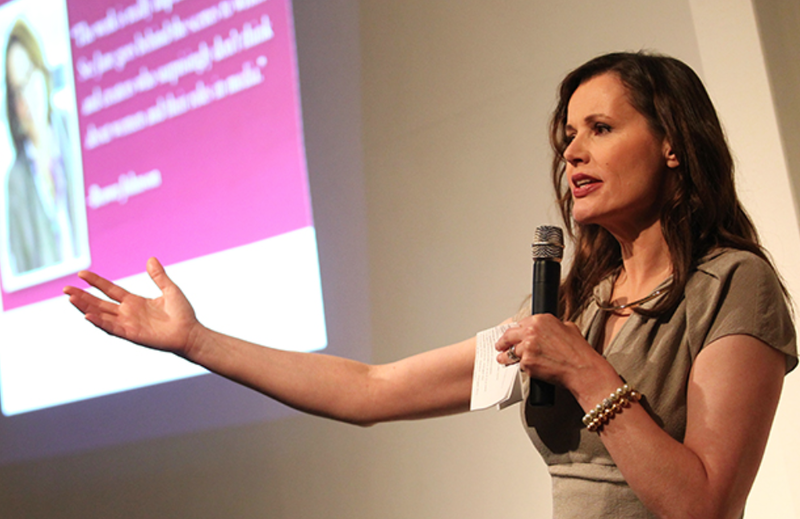 Bonus: Remember Geena Davis from “Thelma and Louise”? She is letting her voice be heard in another arena. Check here to find out more. Your thoughts and opinions are worth more than the 3-cent postage stamp pictured here. Or the dollar on which her image appeared. Thanks for sharing in this column. Once again I learned something new. It is a privilege to vote. Even in today’s election as crazy as it is. We have take a stand for people’s rights our rights and the future for our children and grandchildren. Times are getting harder yet God is still in control. I can’t believe to be the first to respond. If I don’t do it now I get to busy in my day. Have a nice day. Thank you for this lesson of history. You’re welcome, Gloria. Congrats on being the first responder today. I am honored that you peeked into my blog this morning and took the time to respond before you start your busy day at the restaurant. Thank you! I put a picture of Susan B. Anthony over my desk with “Failure is impossible” underneath it as I wrote my dissertation. Like Susan Anthony, I would class you as a woman ahead of her time in many ways, considering the Mennonite culture you grew up in, Shirley. I believe you focused on American Studies, a blend of our history and literature as a graduate student. This declaration strikes me as an appropriate slogan for me too as I move forward with memoir. Yes, it will work! A Grand dame – good on her for voicing what had to be voiced. Oh, that we all did that and spoke up for what we KNOW is right. I’m not so sure about the moniker ‘The Napolean of the woman’s’ rights movement’ – somehow that doesn’t sit well with me. 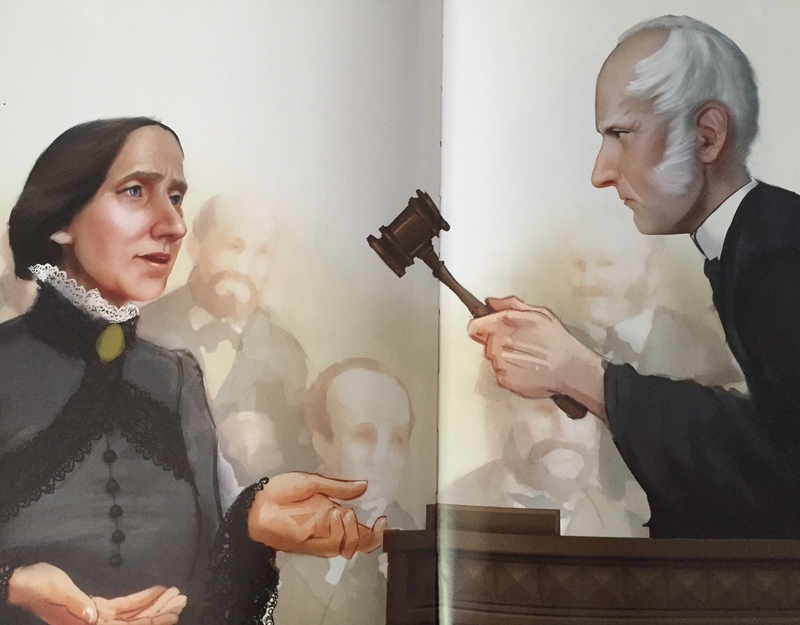 Susan B. Anthony – the woman who bravely stepped forward and said NO to existing prejudice. Something like that. Here’s to all women who challenge that which is clearly not right – thank you for this post Marian. Though this quote has a pejorative tone because of Napoleon’s over-reaching ambition, it probably refers to the wide-sweeping force her cause exuded. I join you in the toast to “all women who challenge which which is clearly not right.” Thank you, Susan! History and literature are an interesting blend. I just happened upon this book when I was looking for the popular “Brain on Fire.” Of course, this find was serendipitous with the federal election this year. Thank you, Jill. My great grandmother was a suffragette! In tribute to all who fought long and hard to gain voting rights for women, every modern woman should proudly exercise her right to vote. Brava to that great grandmother with patriotic fire. And to you also for carrying the torch forward, Lynn. As a woman born in 1951, I definitely sometimes lose sight of the precious rights I take for granted–so for granted. I had forgotten parts of Susan’s story. I think it is hard for us to appreciate the difficulties so many went through. Thanks for this reminder. Even if it is hard to know who to vote for! I think many share your ambivalence about voting during this rather bizarre election cycle. Others, not so much! Your grandchildren would probably be amazed by this well-documented historical tale when they are older. The illustrations are sensational; the story fast-paced. Thanks for registering your views here today, Melodie. Great post. I’m Canadian, so I can’t vote for your president, but this is the first American election where I really, really, really wish I did have a vote. We Canadians have our fingers crossed in a BIG way. Arlene, your comment from across the border is most welcome. I think the interest in this American election is global in scope for sure. Thanks, Arlene! Way to go, Marian! Very timely post. I’m With Her might have been an apt slogan in Anthony’s day too. It is always inspirational to remember history and remind women, especially the younger generation, of our hard-fought battles that challenged those who would oppose what is basically just human decency. Those who would thwart us are in great numbers today, too, and your little biopic here offers a poignant reminder of our journey; that after “changes upon changes” (to quote Paul Simon) we are “more or less the same.” That said, on Nov. 8th I believe we will be celebrating. Susan, I know from your writings on The Women’s Writing Circle and on your Facebook page you have a Heart on Fire for women’s rights and equity for all. I did not mention Elizabeth Cady Stanton, but she and others worked tirelessly alongside Susan. It takes a village and more persisting over time to effect change. I am just sorry Ms. Anthony did not live to see the legislation passed. What a legacy! I too am writing to you from across the border in Canada. In this current American election misogyny is raising its ugly head in a big way. The belittling of women, violence against women and sexual objectification practised by a presidential candidate is shocking, to say the least. This is in part due to the fact that the opposing candidate is female, the first woman to run for president in the USA. It takes a lot of stamina for her to remain calm and in control of a situation that seems almost volatile. You voice the opinions of many in the USA. Thanks for checking in here today, Elfrieda. I always appreciate your perspective, especially as a Canadian. Just as I type this, NPR is reporting on one presidential candidate’s comment about the Canadian healthcare system. Interesting! Marian, Thank you for a wonderful column! I wonder what Susan B. Anthony would think of this presidential election?!! I think she would be appalled at the circus-like frenzy, but she would enter the fray fearlessly – just a guess based on her resolute spirit. Nice to hear from you today, Ann! A wonderful reminder. Some fascinating things I didn’t know! Thank you! A great post and a timely book for children. It is so wonderful that authors continue to write about historic figures that have shaped our world today. I like the illustrations as well. I love her motto “Failure is impossible.” A fabulous role model for those who came after her. The book is remarkable in the documentation (bibliography) more typical in adult literature. Though classified as a children’s book, the author succeeds in capturing historical authenticity and the emotional mood of the times. I forgot that Ms Anthony died before women could vote legally. Okay, Dolores. Sometimes I can go into “edit” and change spellings, but you caught already. All good! You are obviously not alone in trying to interject civility into this discourse. Sadly, it’s probably an exercise in futility. What a woman she was!! !This is such wonderful information-thanks for sharing with all of us. You’re welcome, Pamela. I had a cursory knowledge of Susan’s tireless efforts earlier, but this book put her personality and mission in bold relief. Elegant in its simplicity. We must all be grateful for these strong and courageous women, wherever they are from: we still need them, even today. Strength and courage are needed today as never before – in both women and men around the world. I can tell you recognize this, Fatima. Thank you! Marian — I LOVE this post — I got goosebumps while reading it. The graphics and your supporting verbiage are spot on! Susan B. Anthony is one of my SHEroes! I’ll reserve SiSTAR and SHEroes as signature monikers for you, Laurie. The historical accounts I’ve read of Ms. Anthony’s SHEroism have usually left out the intense fervor of her crusade. I agree, this one hits the nail on the head. Excellent post, Marian. One year when I taught the play “The Night Thoreau Spent in Jail” to sophomore honors classes, I had the entire girls’ basketball team in these classes (and they went on to be state winners their junior and senior years and get big college scholarships). They were the nicest girls, and hardworking and smart, too, plus being superb, disciplined athletes. Hypothetically, they created a night Anthony spent in jail with women from all walks of life and who’s broken all kinds of legal and societal rules, and how her cause became theirs, and their problems became hers. It was their first attempt, but even as amateurs they were passionate about all that was at stake, and it was very well received. Several of the male students served as bit part actors, set creators, etc., and they became strong allies. I absolutely love the way your comments often dovetail with various topics here. Obviously, you were/are a motivating teacher to inspire these girls to ask passionately “if their 4th quarter project could be to write and perform a play: “The Night Susan B. Anthony Spent In Jail.” And to think their passion inspired the boys to get involved too. Wow! Yes, we have to stick together: “strong allies” in this struggle. Thanks so much, Marylin. I want to be in her gang too – woo hoo! You are a mouthpiece for women of this generation, echoing eloquently the voice of the “now” woman. The last two lines are sweet – and laughable – your husband got quite a catch with you, Cherry. I’m so grateful for all these brave women who have made life better for women! Yes, indeed. We can’t totally appreciate the extent of their sacrifice but acknowledge it all the same! 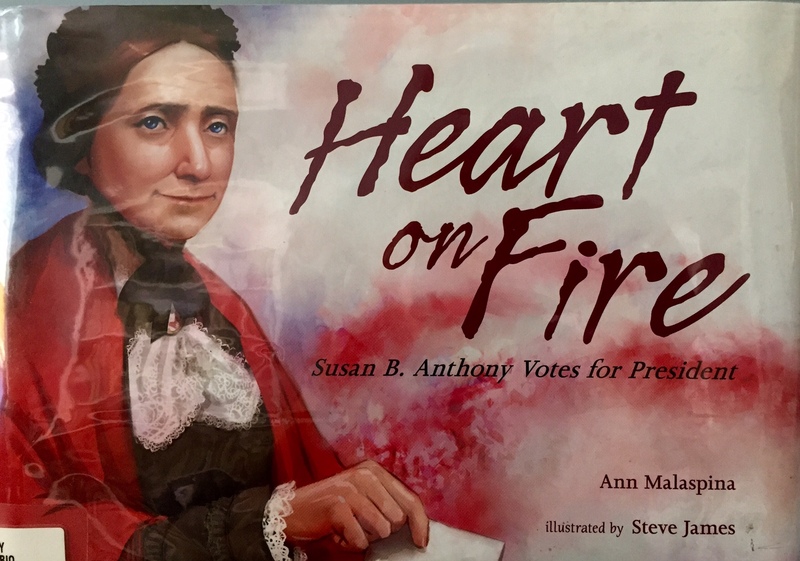 Thank you for sharing Susan B. Anthony’s story! I couldn’t help falling in love with her when I first learned about her years ago; it amazes me that she was willing to endure so much hardship (constant travel, harassment, etc.) and sacrifice so much of her personal life to fight for a right she knew she probably wouldn’t live to see. As her friend and collaborator Elizabeth Cady Stanton put it, “We are sowing winter wheat, which the coming spring will see sprout, and other hands than ours will reap and enjoy.” I’m glad I can reap the wheat they worked so hard to sow! In researching this post I came across this quote but chose not to include it probably because of word count. It certainly deserves a mention – thanks for commenting here, Rebecca. For some the choice of candidates is clear as their platforms are polarizing. For others, baffling. As a Canadian, you have put your finger on the pulse of our country well. I know you have been putting in 16-hour days, so I am honored that you have made time to comment here. It’s hard to imagine a more bizarre campaign than the one we are witnessing now, but I have to trust your opinion. I think some Brits feel the same way, the “Brexit” move being one example. I learn along with you too, Anita. 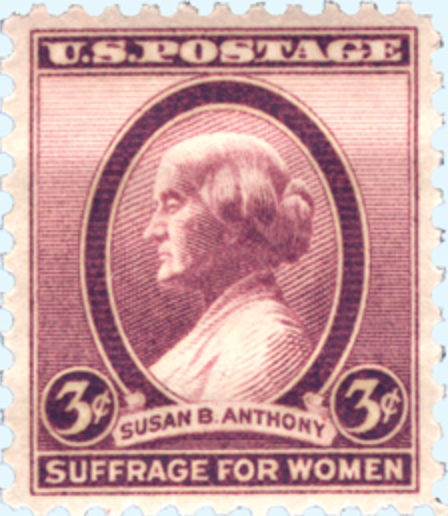 Susan Anthony’s silhouette on the postage stamp was familiar to me, but I didn’t know the rest of the story. My eyes bugged out when I saw all the research the author had done for this story, yet it was so readable for all ages. I can imagine first graders could get something out of it. Women will not be denied. That’s a fact. Just ask Susan B. Anthony! Thanks for the likes, the comments and the sweet tweet today. Very appreciated, Christy. Marian, I don’t know how I missed this post but I’m glad I found it. It is a timely gem. The right to vote is an honor and a privilege.”Failure is impossible” is a mantra to live by. Thank you for enlightening us on Susan B. Anthony’s valiant fight. Thank you, Marian. What a treat and what a good idea. I thought I commented when I read this the first time, but I remember I’d been too tired to tell a story–and I had a story to tell. You’ll remember that when Vic was in the hospital in Rochester, NY. I walked in Mount Hope Cemetery every day. It was the first public cemetery in the US. It has every religion and race. Frederick Douglas is buried there and many abolitionists. Also many women’s rights and voting right’s activists. The paths were endless. The trees were elders. As I walked and read tombstones, I took in lessons about mortality. Because I walked without a map, it took a while to find the hidden corner where Susan B. Anthony was buried. Once I found it, I took flowers there. Thank you for this, Elaine. Our stories provide a map of our lives, especially as we re-trace our steps.